~ Author. Lover. Main Character. Alas! My dear friends & followers, I am pleased to announce another notch on that publishing belt. If you follow me on twitter or facebook OR have personal conversations with me at all, you know I have been dying to see the final product of the newest 7DS BOOKS collaboration, Seven Dwarf Stories. The concept of the book- the previously untold tales of each dwarf before Snow White & the diamond mine sucked me in the moment I heard of it. Dark adult short stories about these merry little folk. Well, sweetie, this is not your bubbly princess fairy tale collection. These dwarfs are bad to the bone. Think about it, seven dwarfs- one house- they must have been social outcasts for one reason or another. Ahhhhhhh. Yes. See. 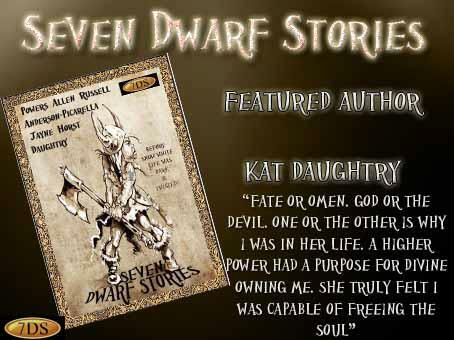 My story, Darling, is the twisted tale of a quiet little fellow- but how did I give a dwarf a Kat Daughtry brand? Mmmmmhmmm. Darling is living his life, out and about, when out of nowhere, fate drops him to his knees with the sight of the one he calls Divine. You guessed it, little Darling is a submissive. An eager to please, quick to protect, natural born sub. He is collared and trained and loved by his sweet Divine. Of course, through in some true dark fantasy, some steam, a magic mirror and you have the tale of love, devotion, sacrifice and you learn how Darling may be the only hope of freeing a soul from a magic mirror for his sweet Divine. That is a mighty tall order for a dwarf to deliver. That’s all I give you. Just that tease. I must say, this book, working hands on in a collaboration, building a world with other authors compared to the normal submission = accept/reject- the end- Has been a most enlightening experience. And speaking of working with other authors- I had the pleasure of working with some of the best Check out this collection and discover each dwarf as you have never imagined, but will never see in the same manner again thanks to the genius imaginations of A.T. Russell, Michelle Horst, Quincy J. Allen, Michelle Anderson Picarella, Dawn Jayne and Everett Powers. Read it, share the word, and show author love- review it! Two mommies obvious “gayness” ruins Disney. Attention Book Reviewers & Book Clubs IMBROGLIO needs you!